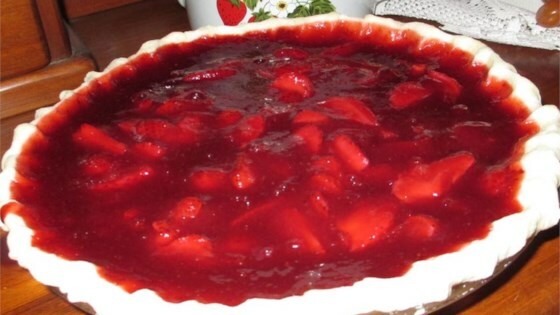 "A great pie using fresh strawberries and sugar-free or regular gelatin." Preheat oven to 400 degrees F (205 degrees C). Line pastry with a double layer of aluminum foil and a layer of pie weights or dried beans. Bake in the preheated oven until edge of crust is golden, about 10 minutes. Carefully remove the foil and weights and bake until the crust has set, about 5 minutes more. Allow crust to cool. Bring water and pureed strawberries to a boil in a saucepan. Stir in sugar, gelatin, cornstarch, and salt until dissolved, 2 to 3 minutes, stirring constantly. Arrange strawberries in pie crust and pour gelatin mixture over berries. Chill until gelatin is set or overnight. What's cooking in Portland? Sarah's grandma’s juicy blackberry pie. May have to slice some of the larger strawberries in half, make sure to let the berries dry completely after washing. Lay them out on a clean kitchen towel, let them dry for several minutes and pat them with a paper towel before putting into the crust. Try brushing the top of the completed chilled pie with a little melted apple jelly to give it a glossy top. This was fantastic. I used a strawberry/rhubarb puree and WOW it tasted so good. This is a sweet pie so if you don't like sssswwweeeet then don't make it or complain. Took most of day to firm up. Didn't set up for me, the filling was tasty but like water. I'll keep trying for the perfect strawberry pie recipe. this pie is great thank you.i did cut back on the sugar to 1/2 cup just my taste but wow it is good. This is the worst pie I've ever had. Way too much sugar and the jello does not help anything. The best strawberry pie ever !! I think adding the 1/3 cup of purée is what makes it extraordinary. Also it comes out of the pan perfectly - no falling apart as I have found with other recipes. Great, but cutting to 3/4 c. sugar for the 2nd pie.